In compiling a list of the markets most impacted by the latest recession, one would be hard pressed not to include Georgia, and specifically the Atlanta real estate market. While the downturn in Atlanta was not as publicized as say Detroit, it was one of the markets most damaged by the bubble bursting. Subsequently, the decline was due, largely in part, to an “economic fluke.” The city experienced such an influx of new homes prior to the downturn that the overwhelming new supply kept prices from inflating. In other words, they never experienced the upside of the bubble. The Atlanta housing market, therefore, witnessed prices decline as much as 40 percent, but from non-inflated levels. For as much as the Atlanta housing market was crippled during the recession, it appears to have made significant improvements. Gains in the past few years have helped to pull the local market out of the post-recession price weakness. Home values have improved dramatically and are now stabilizing. In fact, Zillow has already forecasted home values to increase by as much as 4.6 percent in the next year. According to several indicators (sale-to-list price, price cuts and time-on-market), Atlanta is a warm market that is favoring sellers more than buyers. The median price for a home in the Atlanta area is approximately $167,800, which represents a 6.2 percent increase over the previous year. Conversely, on a national average, homes have only appreciated 6.1 percent in the same period. Perhaps even more encouraging, homeowners in the Atlanta housing market have gained an average of $58,930 in equity over the last three years. For all intents and purposes, the Atlanta real estate market is heading in the right direction and home values are expected to rise for the foreseeable future. 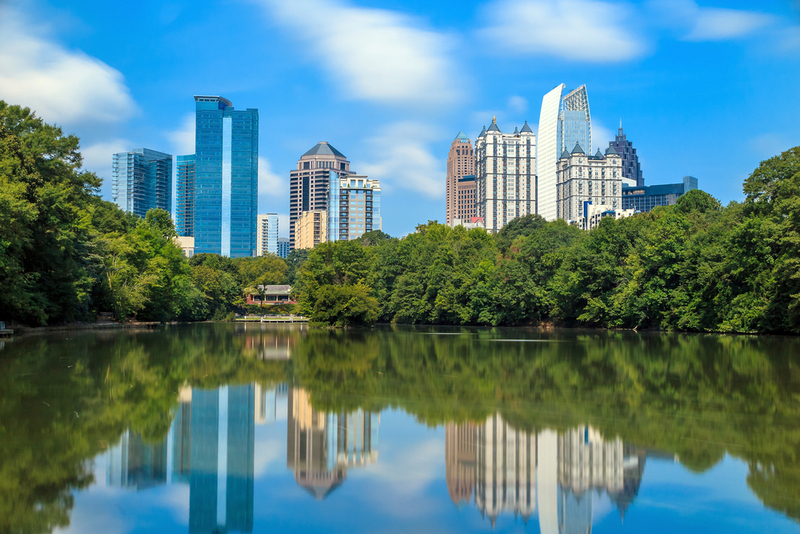 Popular neighborhoods in Atlanta, in particular, are expected to continue the upward swing: Midtown, North Buckhead, Downtown, Kirkwood, Morningside-Lenox Park, and Grant Park. Homes purchased in the Atlanta, GA housing market one year ago have appreciated, on average, by $12,452. The national average was $15,781 over the same period. Homes purchased in the Atlanta, GA housing market three years ago have appreciated, on average, by $58,930. The national average was $49,356 over the same period. Homes purchased in the Atlanta, GA housing market five years ago have appreciated, on average, by $75,642. The national average was $68,727 over the same period. Homes purchased in the Atlanta, GA housing market seven years ago have appreciated, on average, by $64,836. The national average was $59,758 over the same period. Homes purchased in the Atlanta, GA housing market nine years ago have appreciated, on average, by $19,029. The national average increased $16,435 over the same period. Auction homes have decreased by 59.0 percent over the past month, and 66.1 percent over the last year. Bank owned properties have increased by 17.0 percent over the past month, and 37.5 percent over the last year. The first quarter of 2016 was mildly successful for the Atlanta real estate market. While the median home price was $167,800, down from the national average of $215,767, home appreciation was on track. Appreciation gains in Q1 were right on pace with the national average — 6.2 percent compared with 6.1 percent. Gains for the last three years, however, total an appreciation gain of 45.8 percent — almost double the national average of 22.6 percent. What makes Atlanta’s real estate market so appealing for homeowners and investors is affordability. In fact, the historical average for monthly mortgage payment to income in Atlanta is 10.2 percent compared to the national average of 19.5 percent. The good news is home affordability is even more affordable in Atlanta as the monthly mortgage payment to income in Atlanta was 7.9 percent in the first quarter of 2016 compared to the national average of 14.5 percent. Another component to Atlanta’s growing real estate market is new housing construction, which is significantly on the rise. Compared to the national average of 11.3 percent, housing permits for single-family homes have increased 17.2 percent in the last year alone. In fact, the current level of construction is 78.2 percent above the long-term average. The Atlanta real estate market began 2015 with a median home price of $158,000 compared to the national average of $203,867, and an appreciation rate of 11.3 percent compared to 6.7 percent. However, the end of 2015 saw the median home price in Atlanta rise to $169,200 with an appreciation level of 7.3 percent. In fact, the three year appreciation rate more than doubled the national average at 583 percent compared with 23.6 percent. Two critical components of the real estate market in Atlanta have been unemployment and foreclosure filings. The end of 2015 saw unemployment rates drop to 4.9 percent, 0.1 percent below the national average, while the one-year job growth climbed above the national trend at 3.0 percent compared to 2.1 percent. The rate of mortgage delinquency for the Atlanta real estate market in 2015 was 3.2 percent, a significant improvement from previous years. In total, there were 13,120 completed foreclosures during the year, a 18.0 percent decrease than the year before. The primary boom for Atlanta’s real estate market in 2015 was home affordability, which has historically been among the best. At the end of the fourth quarter in 2015, the ratio of monthly mortgage payment to income was 8.4 percent compared to the national average of 15.1 percent. Historically strong, home affordability in Atlanta continued to improve in 2015. The Atlanta housing market has made significant improvements since the recovery began to gain traction. Most importantly, the amount of distressed properties that once ran rampant in Atlanta have tailed off considerably. With fewer distressed properties made available, home values in Atlanta have increased. In fact, 2014 saw the appreciation rates in the Atlanta real estate market outpace both the entire state of Georgia and the national average. Where homes in Atlanta saw an 11.5 percent increase, Georgia only saw a nine percent. On a national level, homes appreciated at an average of six percent. Even with appreciation rates being what they are, the city of Atlanta still had one thing assisting buyers: affordability. In 2014, Atlanta was more affordable than most markets across the country, with homeowners in the Atlanta metro spending nine percent of their income on monthly mortgage payments. On a national level, homeowners spent an average of 16.3 percent of their income on premiums. At that rate, Atlanta became more attractive to younger Americans. Millennials, in particular, were seeking out cities like Atlanta because of the relatively low cost of housing and promising job growth. The influx of potential buyers was just what the city needed to thrive in the coming year. In 2014, the average sales price for a single-family home in the Atlanta real estate market was $251,509. That was up from 2013, when homes averaged $228,815. With increases in home values, listings of single-family homes went up while the amount of days they lasted on the market going down.